'Things From The Flood' Is Gorgeously Creepy And Strangely Human Simon Stålenhag's new book of paintings is a followup to his unique vision of a robot-and-monster haunted alternate Sweden. Each page is heavily freighted with dread, but you can't stop looking. Somewhere out there beyond the cordons, beyond the fields and marshes, abandoned machines roamed like stray dogs. They wandered about impatiently, restless in the new wind sweeping through the country. They smelled something in the air, something unfamiliar. Perhaps if we had listened closely, we would have heard it. We may have heard the sound rising from the forgotten and sealed caverns in the depths: the muffled pounding from something trying to get out. 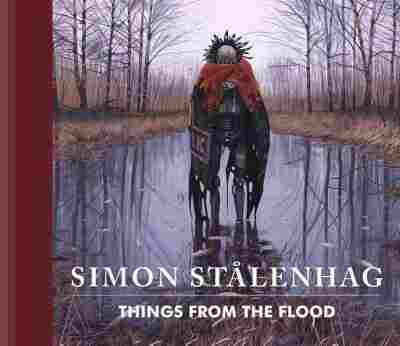 Things From The Flood, artist and author Simon Stålenhag's newest slow-dive into his robots-and-monsters alt-history Sweden, opens with dread. With a lurking, skin-crawling fear that only deepens with each page turned. And even though you know that everything will turn out mostly okay (the central conceit of both Stålenhag's first book, Tales From The Loop, and this straight-line sequel, is that they are memoir — recollections of a machine-haunted 1980's childhood in the Swedish suburbs which the author, obviously, survived), those pages get heavier and heavier as you go until, finally, each beautiful and deeply affecting art panel or brief gut-punch of accompanying text feels so freighted with loss and disorienting strangeness that the pages become hard to lift. You fear what comes next in the best possible way. And you just can't stop looking. ... each beautiful and deeply affecting art panel or brief gut-punch of accompanying text feels so freighted with loss and disorienting strangeness that the pages become hard to lift. In Tales, Stålenhag looked through the eyes of a child at the pastel-colored suburbs and factory towns and filled them with robots. It was a dreamy, science fictional youth turned real, and even when it went dark (which it did, and rather quickly), his savage children seemed to pick through the ruin of the past with a glowing and fantastical joy that burned around them like halos of geeky fire. In Things, translated by Martin Dunelind, that is gone. Stripped away by puberty, by disaster — by the cull of imagination and multiplication of violence that comes of growing up. It is the 1990's now. Foul water has risen to flood the town and bring nightmares. And in the courtyard of an apartment block, Stålenhag's narrator holds a literal gun to the head of his childish things. This is from one of his brief vignettes, called "Russian Teddy Bears" where the narrator is ... dissatisfied with the reaction he is getting from a used AI teddy bear given to him by his father as an age-inappropriate gift. So one Saturday when I was bored and playing around with my grandfather's old pocket pistol, I had an idea. I would give the bear one final chance to prove it possessed some sort of reason. I took the bear out and placed it on the ground behind an electrical cabinet. "Sad little critter," I thought, or I may have even said it out loud. I took the gun out of my pocket and aimed it at the bear's forehead. Then I got the reaction I had been hoping for. One of the most remarkable tricks Stålenhag was able to pull in Tales was the way he was able to conjure a complete and believable world with nothing but a handful of words and a single striking image. His pictures weren't worth a thousand words, but ten thousand. A million. In them lived entire novels. Films that ran on behind my eyes when I blinked. But in Things he has done something that is, perhaps, even more remarkable. In a book that is absolutely about robots and teleportation, conspiracy theories and all manner of beautiful, disturbing, high-wire strangeness, what I remember most is the heartbreaking story of the narrator's best friend being forced to move to another city by his mother. What I remember most is the kid in his class who smelled funny and who no one liked, who had to rush home every day after school to "feed his dragons." What I remember is the least strange illustration in the entire book — of a Swedish police car rolling down a wooded path — and the story of the narrator's mother's boyfriend the cop trying to have a terrible "man-to-man" talk with him about why he'd hit the kid's mother. What I remember is a wordless three page run of panels toward the end of the book which show the narrator and a girl smiling, goofing around, examining two machines standing in a field of wildflowers, then a closer-up shot of her holding him while he cries, then a reverse-angle showing them walking away, and a slick of blood and bones spewing from the back of the machines. That, weirdly, is a love story in Stålenhag's imaginary world. Because, despite the robots, the story he is telling here is a deeply human one about endings and beginnings, about growing up and the loss of innocence that is a necessary corollary to that. And I know it might not sound like it, but it is beautiful.